It's been a whole 3 days since I've posted! Friday and Saturday were definitely super busy. :) Here's a quick rundown: Friday night I saw Black Swan with my friend Jessica. Oh my gosh. So disturbing and amazing. I loved it. But it was so. weird. We spent the rest of the night making fliers for a Valentine's Day carnation fundraiser for our choir. Saturday I started my interning job at a shoes and accessories boutique called Mara in the downtown area of my town. It's not a store I would normally shop at, because I don't have the money for it - to be blunt. However, the owner buys very beautiful things - very unique too, which is lovely. I'm simply interested in learning more about retail and how the whole process works, so it will be good! I think I'll be doing this interning 2 days of the week, either Thursdays and Fridays, or Thursdays and Saturdays. I wore this today to church, and as per usual, my mom helped me out with photos afterward! It's really convenient because we hold church at an art and garden center, so there is a lot of beautiful scenery to take advantage of. Unfortunately, today it was cooler, and not too sunny. Friday and Saturday it was in the 60s! Crazy. It's about 50 now though. I'm so proud - let me tell you! 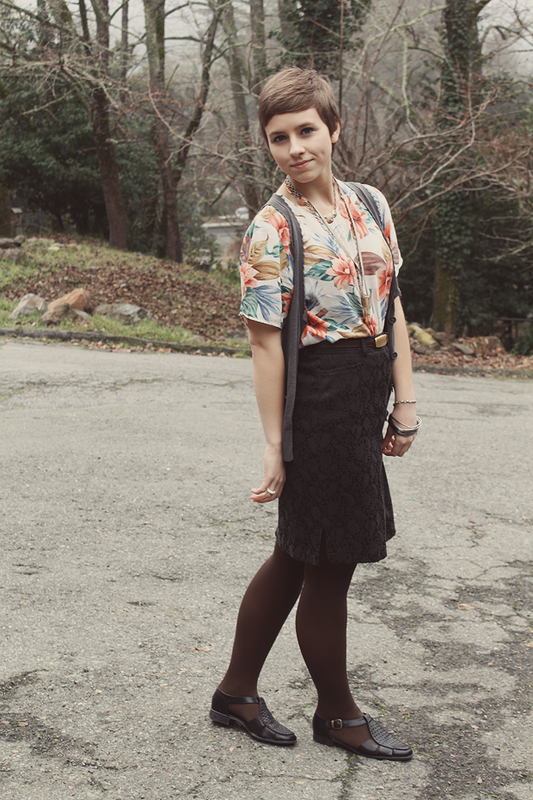 - the main items of my outfit are thrifted! Woot! Have a relaxing Sunday...! 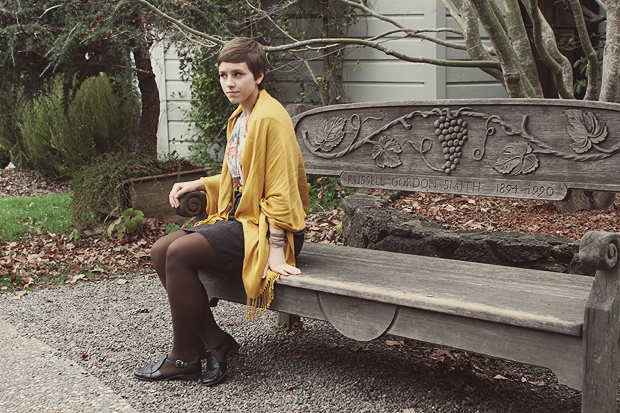 Oh goodness, I'm loving that top paired with the shawl. You look perfectly classic! I'm glad I'm not the only one who reacted that way to Black Swan. Goodness, we've both had quite the week! And thank you ever so for the sweet birthday wishes! The outfit looks amazing. That mustard scarf is delicious. And the photo of you sitting on the bench is perfect. That shirt is such a great find! beautiful! you have such a pretty face!! I love that hair cut on you! and your layering skills are a-maz-ing! the outfit is great and when I saw 'scarf: target' I was like, where? and then BAM you added it in such a chic way...I love that color! can't wait to see photos of the concert!! That sounds like a fun place to have church...and a beautiful one as well! Your scarf is such a great color. I hope we can hear some of your music someday! Cute outfit! 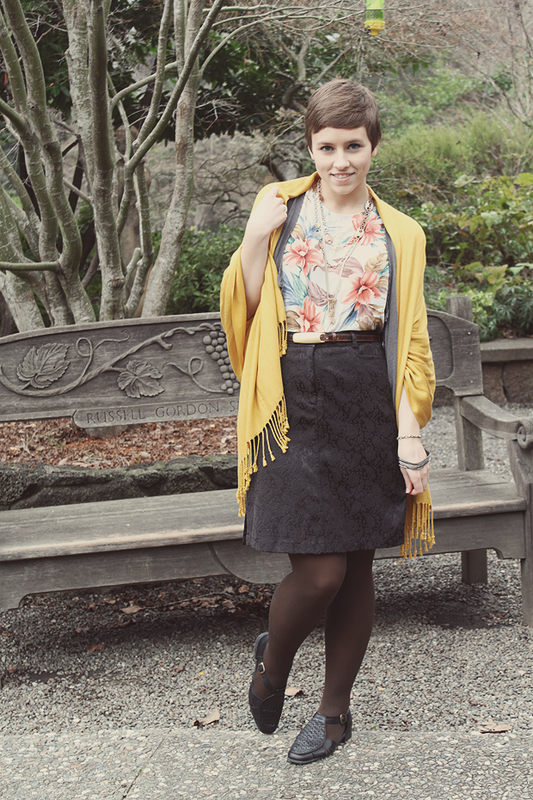 I really love the brown tights, maybe I can get a scarf like that WHEN TARGET COMES TO CANADA!!!! Can you tell I'm a little excited that that is happening?! haha. Hope you had a lovely weekend! Wow, you have been busy! 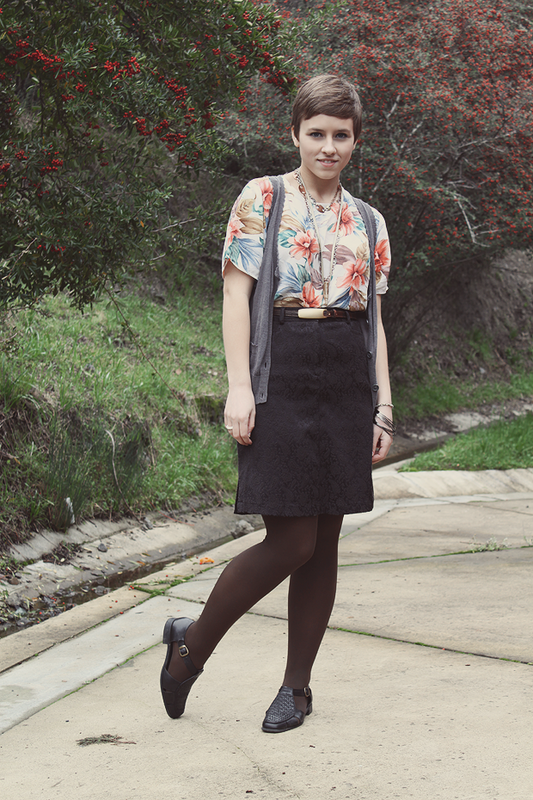 Well this outfit is very lovely and yay for having so many thrifted pieces. Oh, and even though its been months, I still am so in love with your hair!! 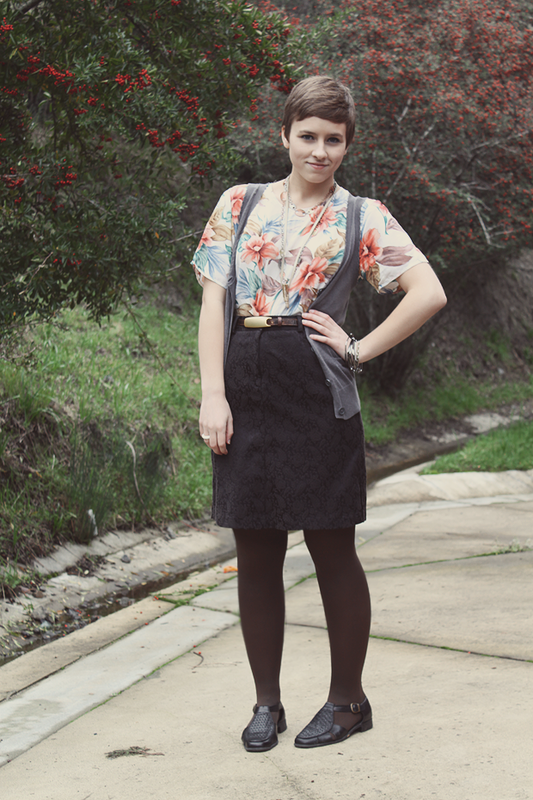 I love that floral top, its quite unlike any other floral top I have seen. Also loving that vest and the mustard colour of the wrap. hi girlie! thank you so much for visiting, your blog is so lovely! beautiful photography - and black swan was AMAZING! YOu look so adorable ♥ Gorgeous color of the scarf ! what a very cute church outfit. I love that your mom took such wonderful photos of you too. My mom always gets her thumb in every set of photos she takes so I never let her touch my camera haha. The print on your shirt is so cool! Goodness me! I am so excited to have discovered your blog. Seriously, I can't even remember the last time I was so excited about someone's blog. You have seriously amazing style, and I can't wait to keep up with all of your future posts. You definitely oughta post the photos of your band. I'm really interested in seeing them! and congratulations on your interning job, I'm excited for you to learn all sorts of new things! I adore your shirt, the flowers are real pretty.